Education is the Art and Practice of making people free. Plato´s early reflections upon education were grounded in the conviction that the ethical nature of the individual and society depended in equal measure on it. Justice was impossible in either case without education. If today, Plato´s Republic is less than seductive, it is not because of his conception of education as such, but rather because of his belief that human potential is naturally dictated and distinguishable between social classes and not individuals, thus serving to simultaneously constitute and justify an authoritarian social hierarchy. A democratic society therefore calls for a radically different kind of education, one which above all educates for the self-conscious social reproduction of society, as John Dewey would so eloquently defend. Democracy for Dewey in this instance was not a formal or legal organization of political power, but a way of being in the world, or again, like Plato, an ethics, an ethics of an internal plurality of shared interests within a group and plural relations with others outside the group. There is very likely no more radical expression of this democratic ideal than anarchism, and thus no more radical democratic education than the ideal and practice of anarchist pedagogy. Instead of here elaborating a theoretical evaluation of anarchist schooling, it is rather a specific example of such a school that we share, the example of the Escuela Libre Paideia, founded in Mérida, spain, in 1978. Paideia strikingly exemplifies a number of different, but interrelated ideas. Its long and rich history, as an anarchist school, testifies to the remarkable dedication of those involved with it. The school is first and foremost a political project, an intervention in capitalist society, with the ambition of contributing to its radical overthrow. This is not of course done through some crude ideological catechism. A collective, free and equal community is by nature anti-capitalist and what Paideia accomplishes with the children that join and participate in it is teaching through the practice of self-management the virtues of cooperative life, virtues that should serve them well when they confront the world beyond. And in the best of scenarios, they may even be led to also challenge the violence of capitalist society. In the words of the same author, anarchist pedagogy is an education against maternal-paternal dependence, private property, authority, egoism, competition and class hierarchy, violence, power and inequality, consumption, and the fictional security that comes with the fetishisation of these norms and structures. Paideia works in what John Holloway might call a crack of capitalism, in this way weakening it, however modestly. What is equally evident however is how fragile such a project is. Not only has its survival in part been dependent on a degree of blindness from the authorities, it also requires a broader community of affinity to make itself sustainable. That is, without parents who share some of the ideals of the school and without the generosity of those who work there (Paideia is not financially autonomous), Paideia would not be. To whatever degree such projects succeed then, their success is very much conditional on being part of larger collectivities, communities. Alone, and with few individuals, they are short lived as experiments. As with radical production or consumer cooperatives, their revolutionary potential rests on at least an ideological commitment to anti-capitalism and the possibility of establishing ever broader relations with other collectivities working towards/creating the same ideals. The following video, made on the occasion of the 15th anniversary of Paideia, offers an excellent introduction to the school (in spanish). Educación libertaria. Un paseo por la Escuela Libre Paideia. Libertarian pedagogy is a different way of conceiving of education from what we are accustomed to. By education we understand assimilation by some of the persons of society, of the values and behaviour that govern its functioning. Accordingly, societies and their models of functioning depend on education to perpetuate themselves in time. The predominant society however aims to maintain certain structures and forms of power that we believe to be unjust, for they do not permit the equal development of people, creating instead politically and economically dominant classes. 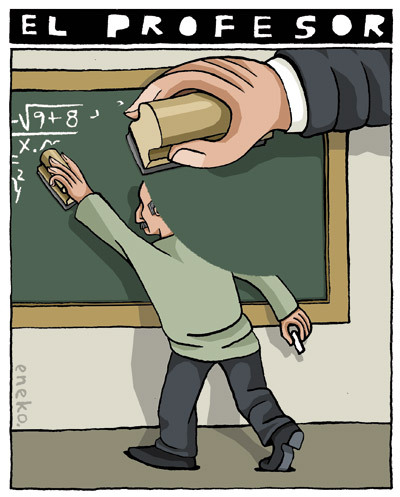 This authoritarianism the society manifests through education, in the creation of dependent, authoritarian and competitive persons who accept the injustices of the system as something natural to humanity, thereby integrating them in a system without solidarity and that maintains inequalities, violence, conflicts and exploitation. We seek a global transformation of society. For this purpose, we must change many of the values of the current society by means of an education that seeks mutual aid, solidarity, freedom, equality, collective ethics, dignity and responsibility, that is, the happiness and well-being of the human being. The whole of society plays a role in education; therefore we must not remain alone in the transformation of the school, as the principal school is life itself. We do not have to centre ourselves exclusively on one specific age, that of childhood, to introduce these ideas. It is however the most important age to introduce values, when the society, the family, power, communications media have not yet negatively influenced ours. But this education should rather be a way of always functioning in our lives. – Freedom of the individual; freedom of the individual, but collective freedom, that is, a freedom which takes into consideration others and from the perspective of the responsibility of living in a group. – Against authority; no one commands anyone else, everything is done through assumed compromises and collective, open and sincere decisions. – The autonomy of the individual, against given and hierarchical dependencies; each individual has rights and obligations voluntarily assumed, collective responsibility and respect. Persons confront their own problems; develop their own convictions and reasoning. – Play as a means to know. By means of play, it is easier to develop solidarity and collective work, socialisation, and a positive, joyful and sincere atmosphere. – Social and co-education of the sexes. Education is equal and combined, without discrimination for any reason of gender or socio-economic status. To further exemplify however, we will explain some of the concrete forms of functioning that permit the realisation of these ideals in their day to day development in something stable and assumed by everyone involved. To create free and self-managed persons, it is necessary that each individual decide, choose and deal with that which interests her/him, without the need for orders from anyone, being conscious of one´s own limitations; that each person elects what, how, when and where they wish to work on the concepts, the activities and the attitudes necessary for their education. Autoditactism is important in this regard, permitting access to information that allows one to learn what one wants to learn, furthermore supporting didactic cooperation in seeking the help of other persons. Creating dynamics of egalitarian and collective work, permitting access to notebooks, books, and other published material or audiovisuals, that are chosen by each; furthermore counting on the assistance of other students or teachers, who are but one more, with more knowledge and educational experience, but who act exclusively as sources of information and counselors without any power over anyone, each person decides on his personal and group didactic commitments that s/he will try to reach in any specific semester. These commitments include not only intellectual elements, but also affective and relational with others. Self-evaluation, with the recording of observations and proofs of maturity serve to check internal attitudes and those with the group, in addition to interests, necessities, and relations, intellectual as well as affective and social. Exams are rejected as repressive and competitive forms of knowing how the educational process is proceeding. Furthermore, daily tasks, such as cleaning, picking up after use, are shared between all people, with responsibilities distributed according to the capacities and possibilities of age. The assembly is the setting for the taking of all group decisions, always motivated by the desire of finding the best solution to problems, and where compromises are sought and are self-confirmed by adherence to them; where we communicate with sincerity with the other persons of the collective and where we give birth to our participation, our relations to others, our criticisms, our self-evaluation. Speaking freely of our doubts, sentiments and proposals, the assembly converts itself into the reference for all decision making, for which therefore there must be a written record of opinions and decisions, as well as a clear organisation for the taking of collective decisions, by consensus if possible and not by vote. The assemblies may be comprised of smaller groups to address specific issues that affect a smaller number of people or general in which case the whole collective participates. If these are some ideas to put into practice libertarian forms in education, the path is long and continuous, with their being many problems that have to be addressed if we wish to practice libertarian pedagogies. Each assembly, each decision, each discussion, and each effort is a further step that should be positively evaluated. If we do not try, then we will not succeed. This entry was posted in Commentary and tagged Education, Escuela Libre Paideia, spain. Bookmark the permalink. Pingback: Anarchy in School: Escuela Libre #Paideia – Enough is Enough!